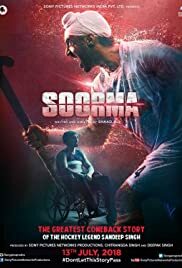 Director: Shaad AliWriters: Shaad Ali, Siva AnanthStars: Diljit Dosanjh, Tapsee Pannu, Angad BediSummary: This is an inspiring true story of the triumph of the human spirit, about a player who faced a near death experience when he was at his peak but emerged victorious by his sheer determination, hard work and unrelenting passion for the sport. Sandeep Singh, a penalty corner specialist in the Indian Hockey team from Shahbad, Haryana made headlines when he was hit in the spine by an accidental gunshot while travelling on a train to join the national team that was to fly to Germany for the World Cup in 2006. The injury left him paralyzed, with the medical community giving him a slim chance of ever walking again. However, not only did Sandeep recover from it but he also made a comeback and re-established himself as the best drag-flicker, going on to captain the Indian national hockey team in January 2009.